Online music studio with recording, effects and virtual instruments! Soundation is a fully featured web music studio with support for recording, editing and creating any kind of modern electronic music. All of its offers are free, and can be accessed without the need of downloading tools, plugins or any kind of local applications. All that you need is a modern web browser and internet connection. Create Online music studio! Soundation offers fully featured editor that emulates professional desktop DAW with total support for recording, real-time effects, virtual instruments, automation, and free database of over 600 great loops and samples. Of course, if that is not enough for you, premium library shops holds in itself over 6000 sounds that will enable you to create whatever you wish to make. Soundation is an excellent free solution for musicians who are on the move and who want always to have a way to express themselves. Try it out! 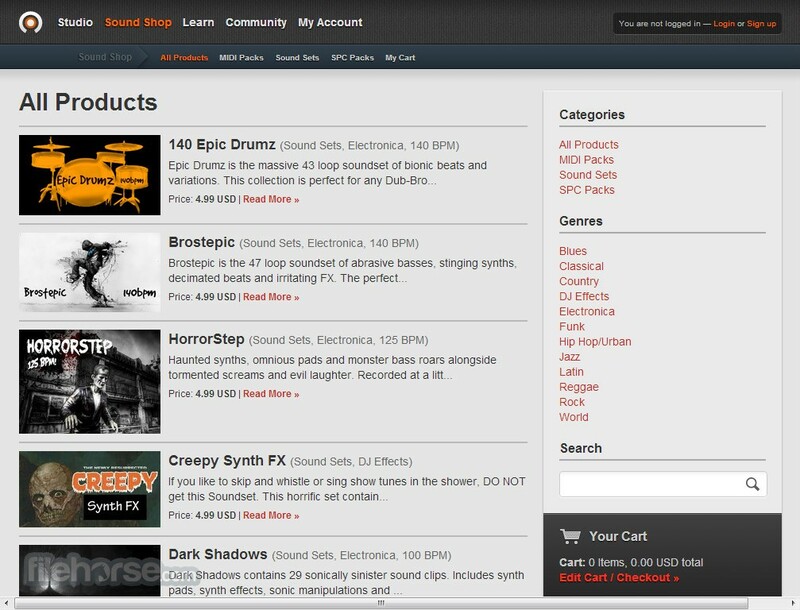 Creation of electronic music directly from your browser window has become a feature of many popular online services, leaving users to manually find which one can best suit their needs. One of the best one you can find comes from PowerFX Systems, and it is called Soundation. This fully cloud powered Digital Audio Workstation offer its user access to most popular audio features that you will need to make your inspiration come to life in form of music. Inspired by the many other services such as Cubase, Logic, and most notably Garage Band, Soundation manages to achieve that hard to find mix of simplicity, versatility, speed, and no-nonsense professional approach that makes it into a service that you really need to take notice if you are interested in music. Simply login from any modern web-browser on PC and Mac, and you will be welcomed with the free editor in which novices, musicians and true professionals can hone their craft in a welcoming environment. Soundation is all-in-one web service that gives anyone ability to control creating, recording, editing and publishing of modern or traditional sounding electronic music. Its entire editor is placed inside yoru browser widow, enabling you to access your work and create new music no matter where you are. Just fire up your PC, laptop or tablet browser, and you can enter into your own world of music. This also means that you can move from one PC to another, never needing to install browser extensions, plugins, PC clients or other apps. All features of Soundation are offered to everyone for free, including all of its real-time sound effects, database of hundreds f free samples and loops, automation tools, virtual instruments, and all DAW features that you would expect to have. If you are not satisfied with the free sample library, you can take advantage of the premium Soundationoffering–library shop with over 6000 premium sound bites, loops and music elements that you can fully incorporate in your own tracks. Create Online music studio! After finishing your work, you can publish it to your account, making it visible to all who come to visit it. You can even leave comments so that your fans can get better insight into your music creation process. Track posting can be private or public. 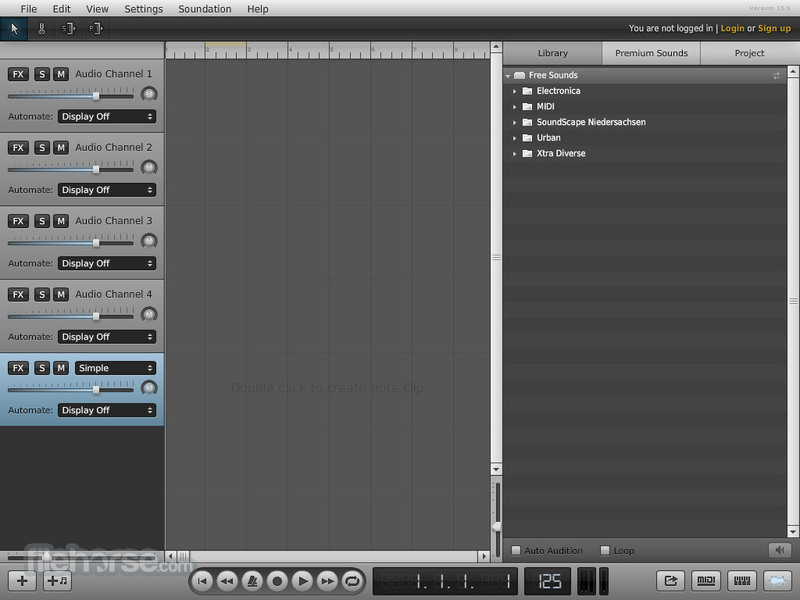 Interface of Soundation greatly resembles one of Garage Band. Everything is placed in good and reachable positions, which will be great news for novices and people who are still not used to quick and effortless electronic music production. The main dashboard is separated in 3 columns – left one for audio channel properties, central for managing sound layers, and right one where you can list free sounds library, premium sounds library, and lists of your projects. Bottom of the screen features general playback options. Free version of Soundation enables you to create as much songs as you like, with access to over 700 free loops and samples. However if that is not enough for you, you can expand its usability by paing one of its three premium subscription tiers. 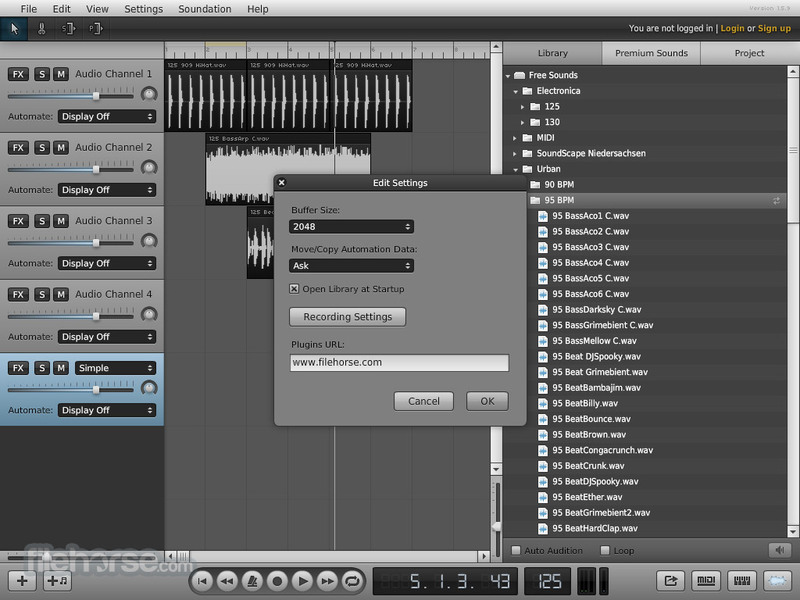 $19.99/year Intro tier gives you 100 MB of online storage and option to record your own samples. For $49.99/year you get Power tier, that increases storage to 2GB and gives you 20 sound sets. The most expensive Premium tier gives you 5 GB of storage, 20 sound sets and unlimited access to access to premium Library, all for $99/year. Soundation is a great music creation tools, aimed to give great experience to novices and powerful tools for seasoned users. It’s free version gives you surprisingly much, so you have no reasons why not to visit Soundation right now and try to create something. Soundation Studio has all the functionality of a professional desktop DAW including real time effects, virtual instruments, automation, recording and much more! And best of all - It’s online, accessible through your browser. 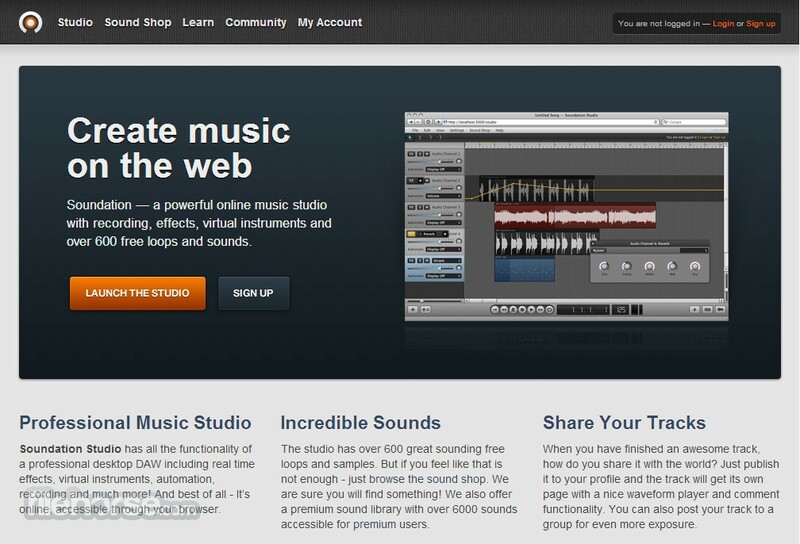 Create Online music studio! The studio has over 600 great sounding free loops and samples. But if you feel like that is not enough - just browse the sound shop. We are sure you will find something! 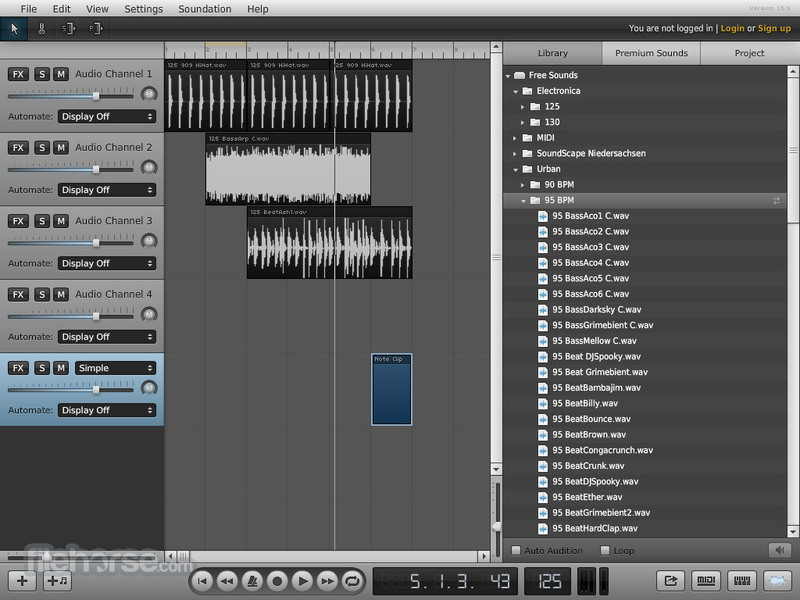 We also offer a premium sound library with over 6000 sounds accessible for premium users. When you have finished an awesome track, how do you share it with the world? Just publish it to your profile and the track will get its own page with a nice waveform player and comment functionality. You can also post your track to a group for even more exposure.